A cheery helloo from us all. Seems like only yesterday we were welcoming Rosey the foal but, by gum, it’s a couple of weeks old now and she’s going from strength to strength. On the work front we have been getting up at stupid o’clock and travelling hither and zither and generally having a fine time (apart from the getting up bit). First off we sailed to France then flew cattle-class to Germany. What a treat we had. Not only got to enjoy fine company but along the way flew the Balleroy Globe Balloon from the lawn of Chateau Balleroy itself and then had to partake in the German version of Father’s Day. More elsewhere in a while. The weather is still giving all of us a hard time not least the ride operators who are finding the going well boggy so have mainly knocked operations on head whilst the BBM&L bucked the trend and managed to tether balloons throughout the Inflation Day spectacle at Pidley. 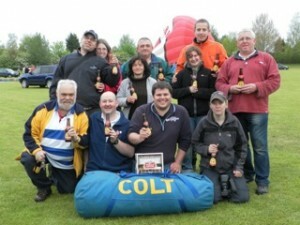 Pictured left is Martin Freeston and Team BBM&L who inflated a very respectable 10 balloons! Brilliant. Meanwhile Lindstrands have issued an update to their last Service Bulletin (SB12) and Camerons have clarified the PRV lifing, details in the news bit. Anyway please have a look round and although we are primarily an EASA Part M Subpart F & G Continuing Airworthiness Maintenance Organisation (CAMO) based in the low clag-ridden Chiltern Hills specialising in the Maintenance and the Continuing Airworthiness of Hot Air Balloons, trying to keep simple the EASA nonsense as best we can and make life for both Commercial and Private Balloonists alike, easier, a bit more affordable and enjoyable (as ever much as EASA legislation can be). To remain sane we do have, and positively encourage, other interests so please have a look around the site as we are adding stuff whenever we get the chance.